Some Santa Maria strawberry growers experienced heavy infestations of whiteflies last year and there are already reports of infestations in some fields this year. Greenhouse whitefly, Trialeurodes vaporariorum has been a common strawberry pest in California for the past few years occasionally reaching high infestation levels that require targeted treatments. It used to be a concern mainly in the Oxnard area. Presence of the cut-back strawberries for second year production aid prolonged presence of whiteflies in the area and contribute to the early season infestations in new plantings. Direct and indirect damage: Whitefly feeding affects plant growth and reduces yield and fruit quality. As they consume large quantities of plant sap, whiteflies excrete sticky honeydew deposited on the plant. Fungi of a few genera develop as black sooty mold on the honeydew covered surfaces. Sooty mold interferes with photosynthesis and affects plant growth. It also reduces the quality of the fruit. Disease transmission: Greenhouse whiteflies are also important as vectors of pallidosis-related decline of strawberries. So, growers should be watching for symptoms of the disease which can be mistaken for nutritional deficiencies or abiotic disorders. Pallidosis-related decline of strawberry is a viral disease caused by Strawberry pallidosis associated virus(SPaV) or Beet pseudo yellow virus(BPYV) along with non-whitefly transmitted viruses. Disease is not caused by SPaV or BPYV alone, but by the infection of SPaV or BPYV along with any of several non-whitefly transmitted viruses. Symptoms of the disease include stunted plant growth, purple to red foliage, and brittle roots with reduced rootlets. Disease causes severe yield loss. 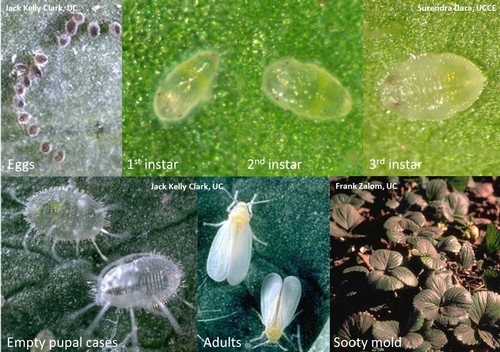 Whiteflies can cause a significant reduction in strawberry yield through direct feeding and indirectly through sooty mold and as viral disease vectors. Biology: Greenhouse whitefly is about 1 mm long and has four membranous wings with white, powdery wax coating. Wings are held parallel to the top of the body. Eggs are small, elongated and attached to the lower leaf surface with a short pedicel. They are pale yellowish green to brown and turn dark with maturity. Eggs hatch and go through four nymphal instars before becoming adults. Immatures are oval, flat and often semitransparent. First instars are called crawlers which move around in search of ideal feeding sites on the underside of leaves. Later nymphal stages are immobile. Fourth instar nymphs are called pupa and have long, waxy lateral filaments and red eyes. Management: Low population densities of whiteflies are usually controlled by the natural enemy complex in strawberries and pesticide treatments for other pests. Heavy infestations require timely treatments to prevent population build up. Monitor whitefly populations by using yellow sticky cards (1 per 10 acres) and counting their numbers on 20 mid-tier leaflets per each quarter of the field. 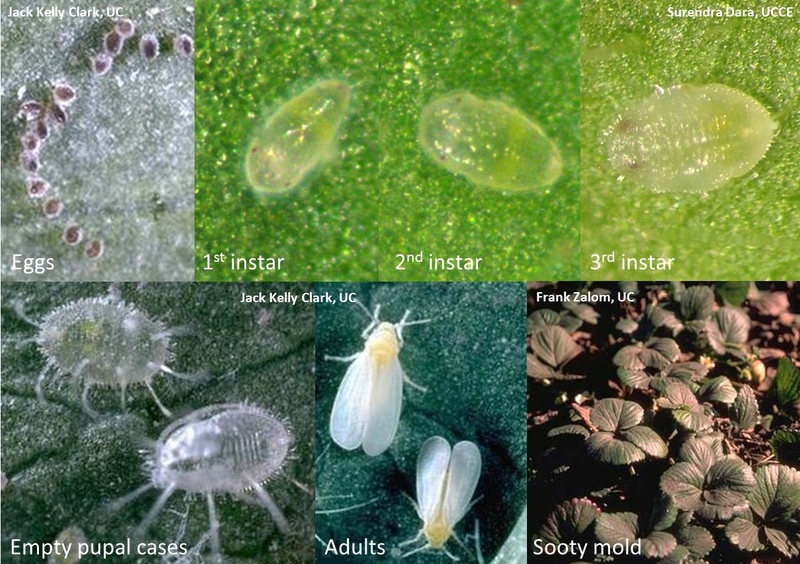 Refer to http://www.ipm.ucdavis.edu/PMG/r734301011.html for additional details on greenhouse whiteflies and their management. My field trials: Among the control options that I evaluated, spiromesifen (Oberon) provided good control in a 2009 trial. 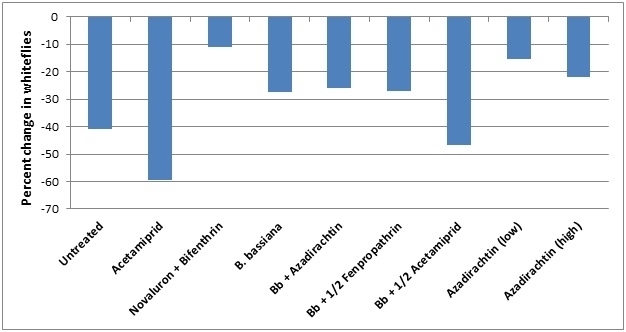 In my 2012 large plot field trial, acetamiprid (Assail) alone at full label rate and acetamiprid at half the label rate along with the entomopathogenic fungus, Beauveria bassiana (BotaniGard 22 WP) provided a better control than other treatments. 2009 Trial: Percent change in whitefly populations two weeks after the treatment. *Note that spirotetramat is not registered for strawberries. 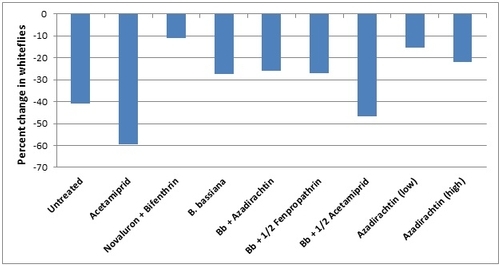 2012 Trial: Average percent change in whitefly populations after three applications. There was a general decline in their numbers throughout the experiment.